I really don't think I can do an adequate job of describing Wing Haven, the nearly three acre garden of Edwin and Elizabeth Clarkson, who lived down the street from Elizabeth Lawrence in Charlotte, North Carolina. 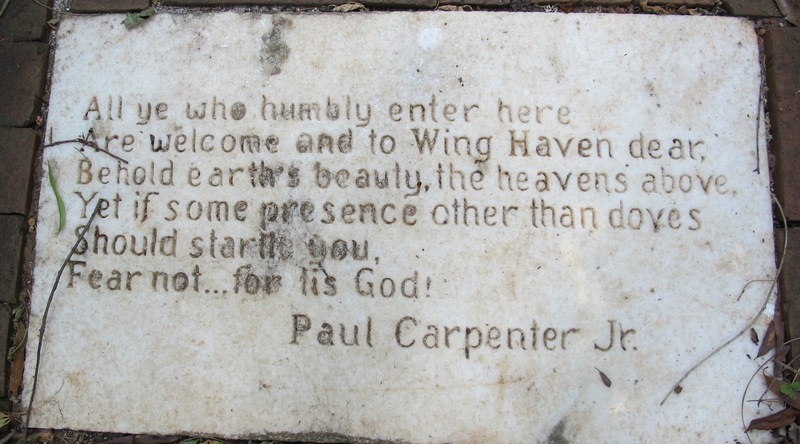 For me, Wing Haven started out as the place to go to pay the entry fee to visit Elizabeth Lawrence's garden. 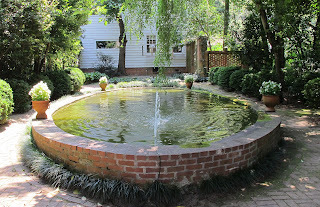 When we had finished visiting Elizabeth Lawrence's garden, if one can really "finish" soaking in the atmosphere of the garden and examining all the plants there, we headed back down the street to Wing Haven. I decided to tour it, too, out of respect for the Wing Haven Foundation, which purchased the Lawrence House and Garden and have committed to maintaining it along with Wing Haven. I am glad I took the time. The first thing we saw was this video. 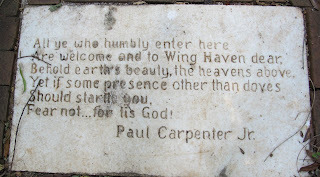 Wing Haven Bird Sanctuary from Cathy O'Hara on Vimeo. You really need to watch the video, if nothing else to learn about Tommy the Bluebird. Here in the middle of this beautiful neighborhood, down the street from Elizabeth Lawrence's house and garden was this three acre garden, a sanctuary for birds, and a peaceful, reflective place for visitors. I headed out to see the garden. 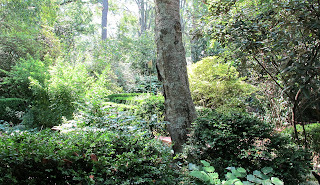 Parts of the garden are wooded. 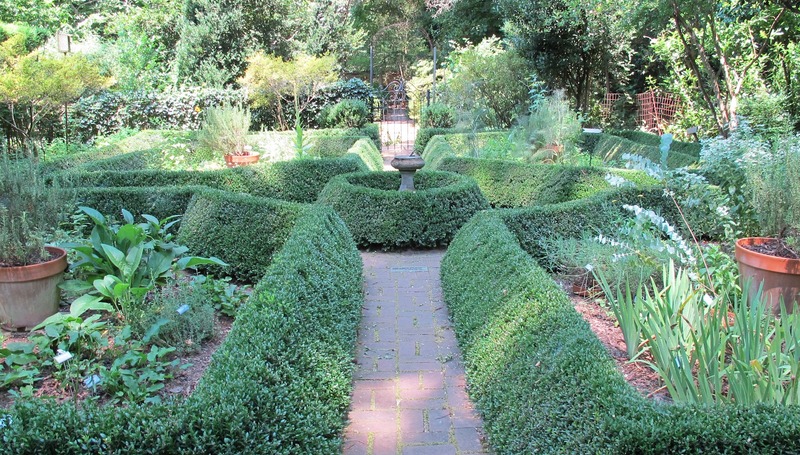 Other parts of the garden are clipped to perfection. There are two large pools with fountains. 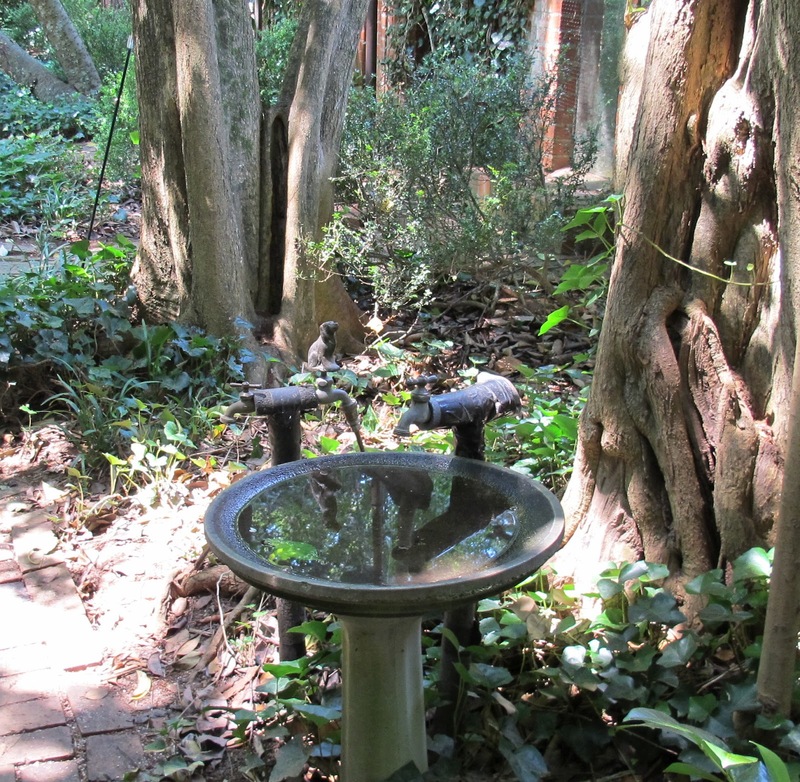 There are bird baths throughout the garden, with faucets to drip water into them. The entire garden is surrounded by a red brick wall. At various places along the wall, there are insets containing statues of various kinds. Here and there along the paths, there are plaques with quotes and scriptures engraved on them. 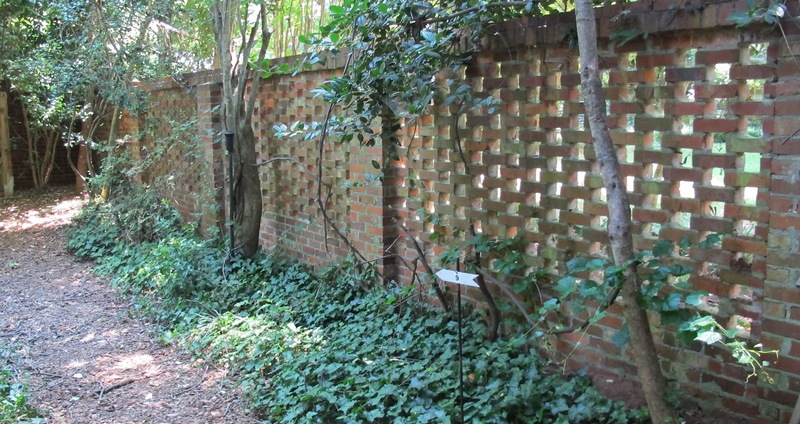 The garden also included a well-manicured lawn, a rose garden, and a children's garden, in addition to places along the way to sit and rest in the shade and wait for birds to come along and bathe in a bird bath or eat from a feeder. Though my time was rushed, I can imagine that in early spring the woods of Wing Haven are filled with wildflowers. I would guess that there were wildflowers in bloom when I was there, but I didn't allow time to look for them, as I should have. Then I'd have a wildflower picture from Wing Haven to post about for Wildflower Wednesday, hosted by Gail at Clay and Limestone. But I don't have a picture of a wildflower. Let that be a lesson to all of us. When visiting a garden, always allow enough time to really see the garden. And find out more about the garden before you visit. A garden like Wing Haven deserves at least that. The next time I visit, I'll spend more time at Wing Haven, on Ridegewood Avenue, just down the street from Elizabeth Lawrence's garden, and I'll look for wildflowers in both gardens. You are oh so right Carol. One must make enough time to thoroughly enjoy the gardens we get to explore. The good thing about not doing so is that you have something to look forward to the next visit. I am positive there are wildflowers there, Carol, somewhere and blooming at some time. It looks to be a delightful place. 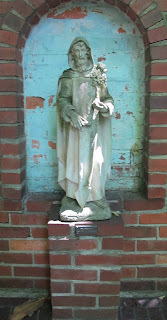 You are right, we need to slow down when visiting and garden and really SEE it.